The Owlet-nightjar is a common nocturnal bird often heard, though rarely seen. It occurs all over Australia, however it relies on log hollows for its existence and therefore it would not occur where all the log hollows have been removed or are already occupied. Owlet-nightjars belong to a unique family having no close relatives with the exception of the Tawny Frogmouth and the true Nightjars. The owlet has silent flight and several methods of catching their prey. They either catch insects on the wing by flying or skimming or they may pursue ants and beetles on foot, however, as they have tiny feet they are much more agile flyers than stalkers. Night-jars also enjoy picking bugs from tree trunks and are attracted to night lights and car headlights whilst searching for moths. The Australian Owlet-nightjar is the smallest (21 to 25cm) nocturnal bird found in Australia, with large brown eyes that do not reflect when exposed to a torch or spot light, unlike others which may look red. The plumage of the owlet can be a russet-brown (rufous) or the more common grey, with two wide black stripes extending from the top of the eyes down to the back of the head. The females are a slightly more rufous colour than the males and young nightjars resemble the adults, however their black markings are less distinct. 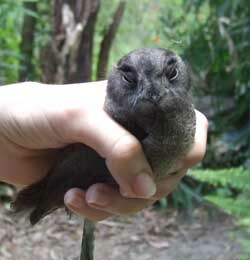 The call of the Australian Owlet-nightjar is a grating chirr sound which could be chirr – chirr - chirr. These birds form permanent bonds, with the pairs occupying the same territory throughout the year. 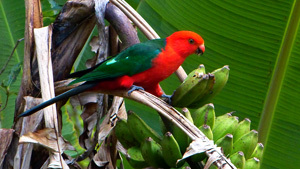 At nesting time both parents prepare the hollow with leaves including the very important eucalypt. These eucalypt leaves are refreshed regularly as they act as an insecticide to maintain the nest’s cleanliness. Three or four eggs are laid and incubated by the female for just under a month. Both the adults feed the chicks, which fledge after a month. The young birds are reported as staying close to the parents for several months after fledging. When the chicks are ready to leave they too need to be able to find a free hollow to call home during the day.